Tac Glasses Reviews - Too Good to be True? Tac Glasses are sunglasses that are uniquely designed for specialized use, in order to enhance the perception of color, fight unnerving glare in the eyes, and to enhance the clarity of one’s vision. These glasses are a product of inspiration that stems from gear used in tactical and military operations involving highly sensitive, multi-purpose, high-grade equipment. This pair of sunglasses uses technology that helps filter light in a specific way by enhancing contrast between colors. The cost of Tac Glasses is $19.99 plus $0.00 shipping. The special TV offer allows you to receive a second Tac Glasses at the discounted price of only $6.95 for a total price of $26.94. Unlike conventional regular sunglasses, Tac Glasses work by filtering out the light radiated onto the lenses of the glasses and producing a clear distinction between various colors. This, in turn, avoids the need for the glasses to have to unnecessarily reduce the required amounts of light from entering the eyes. As a result, the picture you see ends up less dull and lifeless than it would otherwise. With specialized sunglasses like these, in order for them to be fit for purpose, the lenses of these sunglasses are uniquely different from any conventionally similar item available in the market. The lenses of these sunglasses come fully equipped with special technology that can help filter light in such a way so as to create a distinct contrast between images and colors present in the environment. There are plenty of sunglasses out there that are superb in defending you against the elements and the sun, and most of them succeed rather well in doing so. However, when you are out on the road, besides the heat, sun, the elements hitting your face, there is something else that can be quite troublesome and inconvenient to your eyes. What we are talking about here is the unnecessary glare that so often can even be quite blinding when it hits your eyes. Fortunately, with these sunglasses, due to the special yellow coating applied over the glasses, you will not be affected by any of the glary blue light that this yellow film blocks from entering your eyes. The ability to provide anti-glare to your eyes is supremely effective even at night. This is especially true if you are driving or riding a bike and get hit right in the face by light from traffic travelling in the opposite direction from you. Generally, when one puts on a pair of conventional sunglasses, there tends to be a kind of dulling effect on colors. This is due to the fact that these sunglasses cut out excess radiated light from hitting the eyes. However, using special technology built into these sunglasses, they have a unique ability to prevent the picture you see from getting dull. They do so by enhancing the colors to give you a crystal-clear view regardless of the time of day. Not always does one find sunglasses that can be used in almost any kind of weather, no matter how hot or cold it might be. This makes Tac Glasses uniquely indispensable in most situations. However, that is not the case with these sunglasses. It doesn’t matter if it’s raining or snowing, sunny or cloudy, your experience using them doesn’t change or get compromised. As such, these glasses are absolutely perfect when one wants to go hiking or play a bit of golf on a bright sunny afternoon. You can even use these sunglasses while enjoying watersports or skiing. Everyone likes a freebie when one goes shopping, whether online or in-store. In fact, freebies and promotions are regularly used by corporate to encourage loyalty and reward customers for their continued business. Similarly, when one chooses to buy these Tac Glasses online, one will be able to get them shipped absolutely free of charge and only have to pay for the glasses themselves. The strength of these sunglasses should not be misunderstood just because they appear light and easy to wear. These glasses are built from fiber that provides immense strength and endurance to the structure of Tac Glasses. They are resilient to damage, allowing them to be used in the harshest of climatic conditions involving highly rough usage, as compared to many other variants available in the market. This pair of sunglasses has it roots of manufacturing within the military world. It is military sunglasses that have inspired the creators of Tac Glasses to come up with something as uniquely identifiable as this. The manufacturer has only allowed this pair of sunglasses to be available through their own website. Unfortunately, you will not be able to find it anywhere else, in any of the stores around you or even in the supermarkets about. Variation is a matter of choice and the purpose of one’s purchase. Since these sunglasses are made more in terms of function rather than just looks, they do not show any emphasis on variety. You will not be able to have a choice of what color you want the lens to be or even the shape of the glasses. It’s made for those who are not too bothered by these subsidiary parameter and are more interested in just their functionality. Most states and destinations are exempt from paying sales tax. However, if you are ordering to have the product delivered to California, New Jersey, Nevada or New York, then you need to watch out for the applicable sales tax within your invoice. Furthermore, orders placed within Alaska, Hawaii or Puerto Rico will incur a shipping charge within the billed amount. So please also keep an eye out for this. Ordinary conventional glasses shield one’s eyes by using darkened lenses that simply block the entry of light into your eyes. This method works very well in protecting your eyes, but fails to prevent the picture you see from appearing dull and limited due to the lack of light available to the eyes. It can also prove dangerous if one is unable to see objects in one’s path, especially while in one’s car or on a trekking expedition. However, unlike these conventional types of glasses, Tac Glasses uses a unique piece of groundbreaking technology that allows these sunglasses to very conveniently filter out the light that goes past their glasses. In doing so, the light is filtered in such a way as to provide your eye’s retina with amazingly clear and distinct colors, resulting in pictures that seem like out of a high-quality camera lens. Tac Glasses are military inspired sunglasses that help to block out glare and enhance your vision. They are designed to survive in even the harshest conditions and the lenses have a anti-corrosion coating that prevent damage from alkaline conditions such as exposure to oceanic sprays. These glasses also feature amazing light filtering technology that lets you see colors with eagle-sharp vision. While improving and enhancing your vision, they also block out harmful UV rays that can otherwise cause damage to your eyes. Ordinary sunglasses tend to make things darker. This only makes it harder to see things in certain light conditions. Tac Glasses boost your vision so you can see with much crisper clearer vision, even in low light. These have a lightweight design and are very similar to what is used and worn by those who serve in the military. Tac Glasses are meant to be used just like you would any other pair of sunglasses. They are great for driving and other outdoor activities hiking, sports, water sports and skiing. These are designed to block out glare which can be dangerous when driving or doing some other activities. The glasses let you see clearly and keep the sun out of your eyes. Tac Glasses come in a single size that is meant to fit firmly and tight on your face when worn. These glasses are only available online or by calling the company to place an order. These are designed for both men and women. Has a flexible frame and anti glare and anti scratch lenses. Similar unisex sun glasses that come with 4 different interchangeable lenses that offer 100% UV protection. Another similar pair of sunglasses. However, these come with 5 interchangeable lenses. These anti glare sunglasses are excellent for driving at night. They help prevent the glare from car headlights coming the other way. Perfect for foggy or rainy conditions. Lenses have 7 layers that polarize and help block out any harmful UVA or UVB rays. There have been complaints that this product has a stiff awkward fit and has rough edges. It did not fit properly on their face. There have been complaints that this product feels cheap and did not perform like they thought they would. One review claimed that there was a cancer warning on the packaging. Many people claimed that they were disappointed with this product and do not recommend it. There are claims that there is no difference in clarity or glare between the Tac Glasses and regular sunglasses. Tac Glasses are not meant for those who need prescription glasses to see. These are not prescription glasses and are not meant to replace them. Instead of spending money on costly polarized sunglasses, Tac Glasses give you what you need to be able to see clearer at a fraction of the cost. Do not buy Tac Glasses online before searching Amazon. Looks Like a bad buy to me. All I see is bad reviews on these glasses. That is a red flag. I will not buy this product. As an active duty 11B stationed at FT Stewart, I've had these glasses for 5 months now and they have done all the ads say. The view is sharper no doubt. Not by a considerable amount, but you can tell the difference. I'm guessing the barrage of neg reviews is from competitors. Bottom line, I love these glasses and wear them every day as do many of my comrades. These lasted one week. No number can be found to discuss guarantee. Made in China! I have a Nevis mole on my eye; these can become melanomas when subjected to too much sunlight. Tac Glasses are BAD — while they are “dark” and open your pupils, I can find no information that they protect from UVA/UVB! That is a huge flaw and I’m surprised they haven’t been sued yet for endangerment. These glasses are great for your trumpy bear. Just want to say a big THANK YOU to everyone who posted here. I have a hard time driving after dark because of the glare, especially if it is or has been raining. Saw the commercial last night and if I hadn't come to this sight I would have been right where all of you are. It's a shame you can't all file a class action lawsuit. After reading the last thing on this page, that this company partners with Amazon's advertising program, Amazon gets a thumbs down from me, again. Maybe Amazon should be charged with false advertising. Not worth the price. Night glasses did nothing. Polarizing glasses worked the same as my old flight glasses. Also, had to pay for return. My order # 368b4201837120067 is not correct. I want to cancel this order asap. Returned with all info required 3 months ago via USPS. Tracked to when it was delivered. Not a word from them and no new glasses. These were the Blue lens. I guess Bell-Howard has gone down the tubes. Everyone has trouble with this outfit. Will not order any thing from them again. Don't waste your money on these. They are cheap Junk. Left earpiece broke off second time I wore them. Lenses are cheap flexible plastic. Not even worth a rating of 1. These sunglasses are poorly made. The frames are the cheapest frames I have every seen. One pair already broke in my glove box. The lens can easily Separate from the frame. The nose piece comes off so easily. Also, I have to adjust the nose piece continually or else it sits to high on my narrow nose. These glasses are JUNK would not recommend any one purchase these and once you receive them there yours they will not stand behind them first time I put them on they broke save your money go to your local Dollar Store. I bought them about two weeks ago. Put them on my face and the frame broke on the top left side. My first and last experience with this company. How do I Return These Glasses? These are the worst sun glasses I've ever looked through. How do I return them? There is no packing slip. I can't find a confirmation of shipment in an email. I really need to return these things. I was very careful to carry the Tac Glasses in the company provided bag. 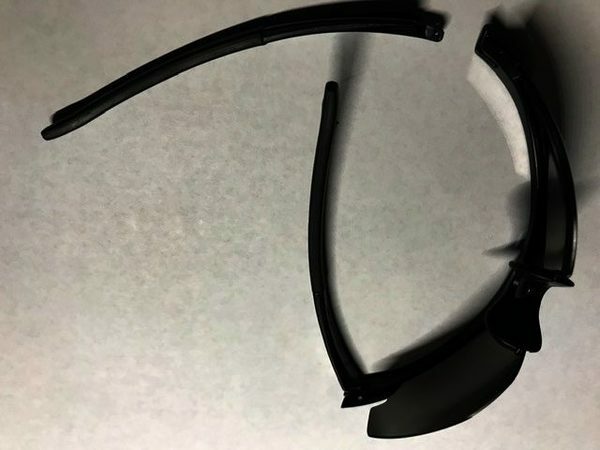 The folded ear pieces scratched the plastic lens. The scratches obscured my vision. They are very dark. Sunlight glare comes thru the top and sides of the lens. Very disappointed. Complete fraud. I bought a pair of these from Amazon, a little under the as advertised price. Right out of the box, is a scratch on one side, not noticeable when wearing, but brand new and scratched. Out the door I go with my new great Tac Glasses to try them. Are nothing but really. Really dark lenses far as I can tell. Extremely disappointed with these. Save up and buy a real pair of sunglasses. P. S Amazon did refund my purchase because of the scratch and did not want them sent back. Gathering dust on my table, all they are good for. I bought a pair of these inside a rite aid store, so thank god i didn't have to go through the online hell i've read that others are going through. I put these on immediately after buying them and found that looking through them is no different from looking through any "old-fashioned" sunglasses. There was no color or image enhancement. It just looked darker/shaded as "normal" sunglasses have done for years. And there was a cancer warning on the box also. Don't waste your money! The entire commercial is a farce. The brightness and contrast of the examples in the video is jacked wayyyyy high, drastically emphasizing the effect the glasses presume to offer. Not to mentioned the complete BS "Eagle in the screen" example. Truly outstanding products speak for themselves without the use of shady business tactics. Any company who uses this sort of misleading, unethical sales tactic should never be supported, and can never be trusted. Do not waste your money. They don't fit worth a dam they do nothing to enhance colors or clarity, didn't block out the glare and don't sit close enough to the face to block out the sun. Also can't see my phone in sun, as for the eagle my old glasses could see it. I need to speak to some one. I ordered 1 pair before Christmas. Received 7 pair today that were not ordered. If you follow the links on the online portal for tacglasses. ( tac is for tacky ) in my mind. You will have to give personal information and cc details before actually seeing charges. When you do this, you will find that there is not way to cancel an order even though there is a link to submit the order. I did not submit an order but that they already had my cc and personal detail they process an order without my authorization. If you call the customer service number you will get someone who sounds like they are in india who cannot help in anything specifically canceling the order. I was told refuse the order or talk to my bank. I recommend both. I recommend do not go to the web page in the first place and look for other eyeglass options,. If you do have my misfortune, cancel your cc and order a new one asap! Refuse the order if you even see one or get delivery and submit a fraudulent charge with your local bank. Given the customer service conversation, they have this complaint all the time and I think they hope that many do not follow these steps. I also suspect that because they are overseas, they do not worry about legal action. The practices of that company need to be looked into; I am filing a complaint with the ftc. The first thing they want you to do is enter your card information without giving you the option to click on a product. Once you do, the system takes you through a series of sales pitches for enhanced products. Advertisement gives the appearance that you get all features in one and you do not ( they are 3 Separate glasses ) ; when I reached the sales line ( 800-816-5294 ) to inquire about this further, they had no additional information on the product. I tried backing out of the system and advancing and could not get to a traditional summary page after several pitches to add this and that, so I simply closed the browser without completing the transaction. Later that evening checking my email, I had a confirmation receipt for payment and this morning a pending charge on my bank account. Now, I am having to go through a fraud process with my bank because when I called Tac Glasses to reverse the charge, they wouldn't acknowledge the issue, placed me on hold, and then told me they could not reverse the charge and I would have to refuse the product ( a product I did not order! ). Save yourself the headache! The ear stems kept breaking off -the glare factor is bull -very disappointed. I have the same problem. Did you have any success with customer service? Still waiting for my glasses when will they arrive? Called and spoke to a a lady said they were shipped but why can't I track them to see where they are now? I am a police officer and thought these glasses would be of benefit to me. They are a complete waste of money and are of poor quality. Nothing like was expected. Nothing like was advertised. Customer service people are terribly rude. Do not buy these. Throw your money in the trash can where perhaps a homeless person can find it and buy some food. Never have I seen anything as terrible as these glasses! Ordered the glasses on 12 / 23 / '17 and never received them. When I tried to inquire about them I found there is no way to contact them. They are very careful to make it impossible to either call or write. I would like to have my money back. I would caution other people to not waste your money on these. The company is obviously not reliable. Ordered them on Dec. 14, 2017. It is now January 23rd. I still have not received them. What's up with that? I am an optician. Do not buy any sunglasses that are not marketed as polarized unless you don't care about protection for your eyes. Order glasses on Dec 232017 haven't received them yet, when will they be coming? Thank you. Simple! Avoid! Mine fell apart within 1 hr. They do not offer replacement parts. You pay for shipping all ways during any transactions! The extra lenses we bought came with no instructions as to how to change them out. The manufacturer has all contact info removed so you can't call them. You have to send letters! ----scam! It would be nice if you had made these glasses that they would fit over someone that has to wear glasses. Consider those people! Don't Even go to Web-Site! I ( thought ) I deleted credit card info after a pop-up "$10 upgrade for scratch resistant lens. " if glasses will scratch easy I don't want-right? I never hit the "submit button. " deleted my information and closed site. Next thing I know email saying glasses are on way?! How did they bill my cc when I never hit "submit". Customer service twice no help received lenses, no different from a dollar-store brand and left lens was loose. Scam! Nose piece came off in about a month. Don't buy upgrade lenses, they have to be manually changed in and out. Night vision glare glassed just make everything yellow, glare is the same. TAC advertises these as military tough but they are just cheap plastic sunglasses. Don't waste your money. Was going to order but after reading these reviews I don`t think so Thanks, everyone that made comments. Because that's what stopped me. What percentage and type of UV light is blocked by the lenses of this product? Very Decieving! Watching the ad with all the features looks great for only $19.99. But! When ordering it cost another $10 each for all the features you think you are getting. Real cost. $40 minimum! The “eagle” demonstration shown on TV is a trick using crossed polaroids. The screen with the eagle photo has a Polaroid film over it oriented 90 degrees opposite of the Polaroid in the glasses. This situation doesn’t exist in the real world and is a very Deceptive demonstration. That is true. Much like the digital watches. Without the polarized lenses, you won't see anything just blank watch. The ad is very Deceptive to those who don't know about polarized lenses. Cross polarisation would block all light, resulting in a black screen, not a white screen. A white screen requires passing all light, blocking none. Disappointed with Bell & Howell. They have been reduced to an online [and on TV] Chinese order taker company! I waited 3 weeks for my glasses. Packaging was Chinese. Glasses were in one box, and polarized lense in another. No directions on how to install that lense. Also, a pamphlet about "Arbitration". What does that tell you? The term "Chinese Junk" does not refer only to a wooden-hulled watercraft. Is there anything sold in the USA that is NOT manufactured in Fu-Qin China? Even the US Flag is made in china. : (. The one-size-fits-all frames must be perfectly straight or one lens hits your face and drives you nuts. If you are driving through dappled light, you have a difficult time seeing your gauges. In very dappled light, you can not see an animal, or human, at the side of the road. If you drive into an unlit parking garage, you must remove them immediately or you are virtually blind. They have more negatives than positives. I expected better from b&h. I tried to order the glasses from their e-mail site. I had a Visa card in my hand and tried to enter the payment information 3 times. All I got was a message telling me my card number was not recognized. Had to call 3 different telephone numbers before I got a CSR whose response was, in effect, "sorry about that". This experience is a nightmare, they are out of stock and do not notify you of this vital information. They appear to be difficult to reach by phone and hold you hostage with their return policy. Don't take a chance on this item. These are no different than any Polarized sunglasses you can buy at Walmart or a Flea Market. They are not actually Markets as " Polarized " and they do nothing to enhance colors or clarity. Don't waste your money or time.